While there may not be too much in the way of Outlander news today, we do have some super-fun stuff to share via Sam Heughan! 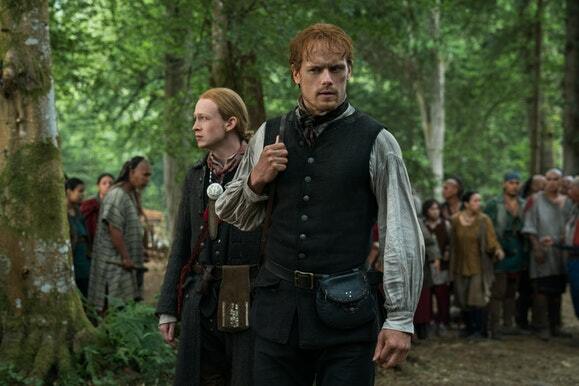 Related Outlander video – Check out some burning questions for the upcoming fifth season at the bottom of this article! Also, remember to subscribe to CarterMatt on YouTube for more insight and be sure to check out our official playlist. In you look at the bottom of this article, you can see a new clip featuring Heughan as he gets a little bit of dating advice for his upcoming My Peak Challenge gala. This video is done in conjunction with his Omaze campaign to raise money for his initiative, which works to improve overall well-being while also supporting two separate charities in Bloodwise and Marie Curie. The winner of the Omaze campaign gets to be Sam’s date for the big event, which promises to be a fun time for anyone who receives it. You’re also getting an opportunity to be flown out to Scotland, put up in a four-star hotel, and get an opportunity to take part in some other events. The gala is really just one part of the overall experience! Now, here’s where things get funny when it comes to the video — most of Sam’s dating advice is actually coming from kids. They tell him about the ideal gift for his date, what he should wear, and also what should happen after the gala. There’s some genuinely some good advice in here! Take, for example, not wearing leather shorts — that’s almost always a bad idea. Meanwhile, saying “how you doin'” in a suggestive manner probably doesn’t work for anyone. All of this serves as a great reminder that asking kids about adult problems is almost always funny, and that Sam has some comedic chops. There’s a reason why we keep suggesting him as a great SNL host, and probably will not stop doing that for some time still until it happens. There are a couple of weeks left on Sam’s Omaze campaign, so this video is a good way to drum up some more attention in the cause. The timing of its release could not have been more perfect, given that this is a reasonably quiet time within the Outlander world as we await the start of season 5 filming in Scotland. There isn’t too much information out there about that right now, but we imagine that this is going to be something that changes over the coming weeks.